We come to work every day grateful for the opportunities we are given to contribute to the success of our customers. 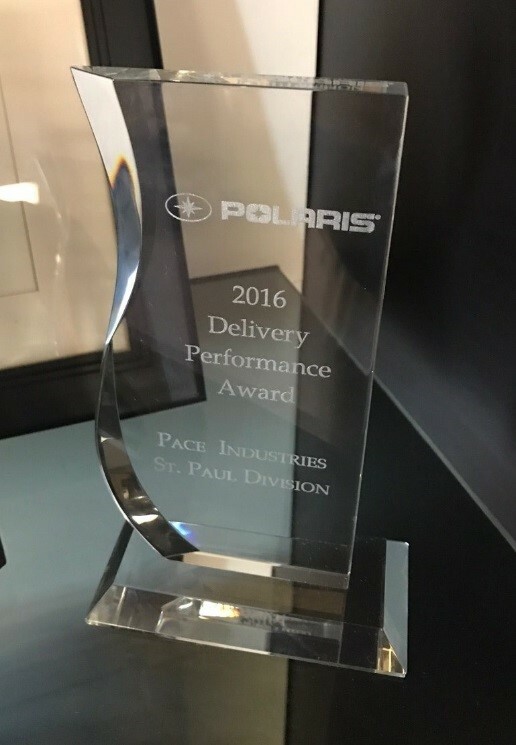 The support we provide often earns the appreciation of clients, but recently our St. Paul Division was especially honored to receive the 2016 Delivery Performance Award by Polaris Industries. Polaris presents this annual award to vendors with an on-time delivery rating of at least 99 percent. At 99.3 percent, we were proud to know we had exceeded their expectations. “We track our on-time deliveries all year so we had an idea what our percentage was, but it was still an honor to be gifted this award,” said Darren Bombich, sales manager of the St. Paul Division. Having a plaque in hand further motivates our team and showcases Pace’s commitment to excellence. “This award is proof of our abilities,” said Bombich. We will continue to improve delivery performance with support from our strategic deployment team, which focuses on improving existing processes for the benefit of all customers. Their monthly tracking and reporting influences our strategy to improve services for customers and allow us to continue providing award-winning support. Our relationship with Polaris began in early 2000’s. In recent years we have shifted focus to better align with their business needs. Polaris makes a variety of vehicles, and we are proud to supply parts for their motorcycles, snowmobiles and ATVs. The products we provide today are different than what we initially supplied because we are now able to offer competitively priced value-add services to their castings, such as machining, painting & assembly. Our goal is to continue increasing our core competencies so that we can always be a reliable resource for our partners. We are humbled to receive recognition from satisfied customers, and given that Polaris holds values of integrity, quality, innovation and commitment that strongly align with what Pace stands for, this award means so much to us. We hope to continue providing all our customers with timely and quality parts for a long time.